Joints bounded by a fibrous capsule whose inner membrane secretes a viscous lubricating liquid (synovia), thus allowing a wide range of motion. An example is the wrist, which the hand can move on two axes: flexion and extension; it can also be tilted sideways (toward the radius and ulna). Resembles the condyloid joint but allows a wider range of motion; this type of joint is rare. The thumb is an example of a saddle joint. Each of the five bones forming the metacarpus. The metacarpal bone of the thumb is very mobile. Bone of the anterior row of the carpus articulating especially with the metacarpal bone of the thumb. Surfaces of these joints are relatively flat and not very mobile; they allow only a narrow gliding range (e.g., vertebrae, certain bones of the carpus). 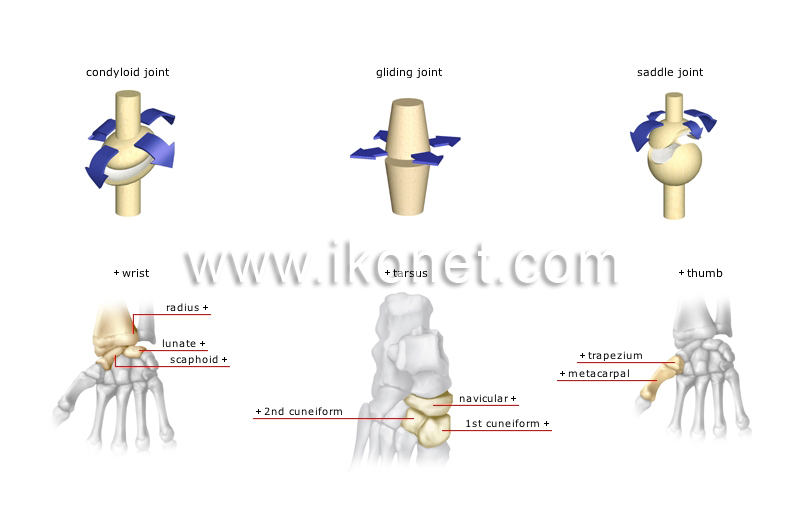 Gliding joints that ensure the displacement of certain bones of the tarsus. Bone of the posterior row of the tarsus articulating especially with the talus and the three cuneiforms. Bone of the anterior row of the tarsus articulating especially with the metatarsal bone of the second toe and the scaphoid bone. Bone of the anterior row of the tarsus articulating especially with the metatarsal bone of the big toe and the scaphoid bone. Condyloid joint of the hand (carpus) articulating with the forearm (radius); it mainly enables the hand to flex and extend. Bone of the posterior row of the carpus articulating especially with the radius to form the wrist. Long bone making up the outer section of the forearm; it is connected especially to the carpal bones to form the wrist joint.